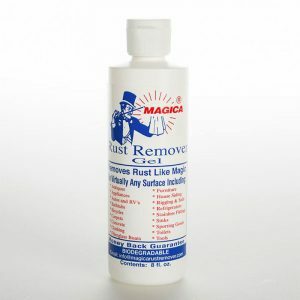 Magica Rust Remover comes in a convenient, easy-to-use 32 oz. trigger spray bottle and works on any size rust stain! 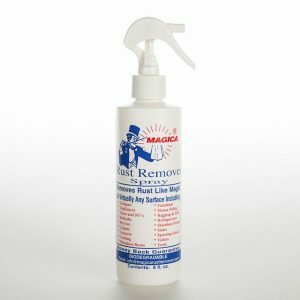 Magica Rust Remover comes in a convenient, easy-to-use spray bottles. It has the same formula as the gel, but is in an easy-to-apply form. The spray allows you to remove larger and more widespread areas of rust. 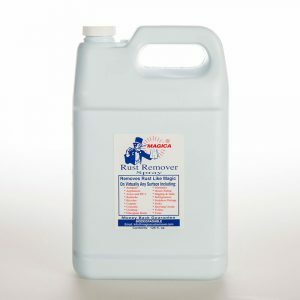 Magica Rust Remover spray does not contain any harmful or corrosive acids, so it is completely safe to use. Our formula transforms the rust stain into harmless salts so they can easily dissolve and rinse away. It works fast to easily remove any stain. It is a larger, easily portable option of Magica Rust Remover in a convenient spray bottle. It’s that simple! If our Magica formula doesn’t remove the stain, then it is not rust. Try Magica today with no risk! We guarantee our product will remove rust stains. If you are not completely satisfied with Magica Rust Remover, return the unused portion with your name and address for a complete refund. Note: Always keep Magica and other cleaning supplies away from children.